Okay, so this week was not big on upsets; some of the lower-tiered ones listed here were borderline reaches. But there were some eye-popping, jaw-to-the-floor-dropping catches. For instance, there was one flying, one-handed touchdown catch by a UCF receiver that put the Golden Knights even with Temple, and thus put them on the path to preserve their undefeated season. A different sort of catch, but one that solidified victory was a tipped pass on 4-and-forever that just so happened to fall within reach of an Auburn receiver going deep. Ricardo Louis managed to reach for the ball in stride and cruise to the end zone for a touchdown that caused Jordan-Hare Stadium to erupt in ecstasy. USC, meanwhile, seems to have been rejuvenated under the leadership of Ed Orgeron. Few experts were predicting a win over No. 4-ranked Stanford, what with the Cardinal’s hard-charging power running game. But the Trojans’ defense help firm enough to nullify the Cardinal’s advantage, and in the end, helped produce the biggest win for USC yet this season. In case someone might think that last statement is an exaggeration, when, might I ask in return, was the last time you saw the students rush the field at LA Coliseum this year? Meanwhile, we all knew this week would come. This time around, it just so happens to be Week 13 where most SEC teams have the unenviable task of being pitiless executioner to FCS fare, glorified or otherwise. The irony is that this time around, these teams are not chump D-1AA teams. Alabama is playing Chattanooga, who is currently 8-3. South Carolina is to play Coastal Carolina, who is currently 10-1 (at least they’re not playing Wofford this time!). Florida will play Georgia Southern, who might only be 6-4 in FCS play, but they’re still a traditional power at that level. But that aside, why schedule these glorified body bag games so late in year? Did we not get enough of these sub-par matchups in September? Speaking of Georgia Southern, though, maybe Florida will finally be able to win a game again. No, that is not a type-o. The Florida Gators (yes, THE Florida Gators) are on a five-game losing streak. Why, you might ask? Perhaps these stats might explain a few things: they rank 101st in the FBS in passing yardage, 82nd in rushing yards, and 112th in “points for,” meaning the total number of points their offense has scored. Yet they rank 14th in points against. The latter is a more-than-respectable stat; the rest of positively abysmal, especially by Florida standards. Clearly, they have a good defense; they are just atrocious on offense. Who is to blame? One possibility is Will Muschamp, who is a defensive coordinator by trade before becoming the head coach in Gainesville. Could he invest some capital in a better offensive coordinator? That might help. But at this point, it leaves fans and observers alike to wonder if he is the man for this sort of job. At this point, it’s a fairly safe bet that that Florida could snap their five-game losing streak on Nov. 23; but the following week they face No. 2 Florida State. What is the “over-under” for the Gators going 5-7 this year, Vegas? 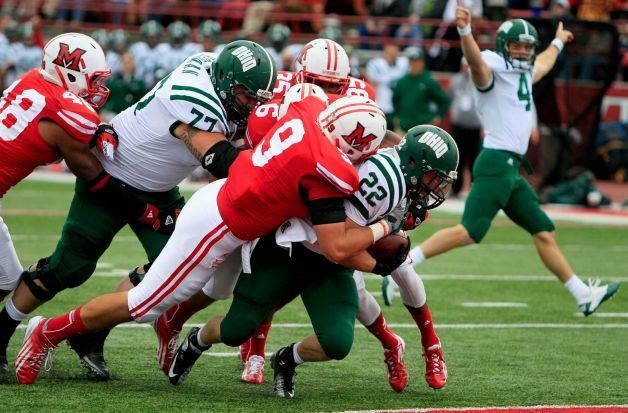 Ohio U: The Bobcats were off to a great start under Frank Solich. They won seven consecutive games, and were even ranked No. 24 going into the Miami (Ohio) game on Oct. 27. After that game, they were undefeated no more. The team lost the next four of five games, including their last one to currently No. 18 Kent State. That loss was understandable, even excusable. Losing to Ball State the previous week? Less understood, even less excusable. But losing to Bowling Green? No excuse at all. Perhaps the Bobcats just ran out of energy, which is one form of hitting the proverbial wall. Correction: A well-informed, experienced observer brought something else to my attention regarding Ohio U. The biggest reason they hit the proverbial wall was injuries, especially injuries to their offensive line. By season’s end, they were playing third-string linemen without any subs — brutal! Upon further review, that might explain their loss to Bowling Green after all! Mississippi State: Poor MSU (the Magnolia State MSU, not the Great Lakes State MSU). They try so hard, but they try to excel in the most brutal of all college football neighborhoods. Dan Mullen has done the Yeoman’s work making the Bulldogs more than respectable, and making their fan base believe in the team’s potential. Seven consecutive games, seven consecutive wins: so far, so good. Then came the game at Alabama: automatic loss. Fair enough. Still ranked No. 16, they were to play Texas A&M at home. That turned out not so well, either. The next game was at LSU; care to guess how that turned out? The thing was, after the big win over Arkansas (45-14), one would think that the worst was behind them. 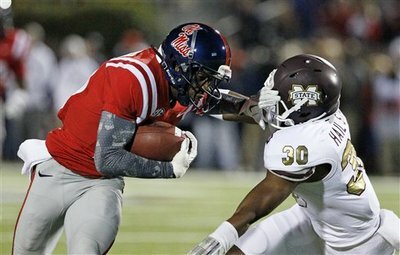 After all, in the Egg Bowl (their traditional rivalry game against Mississippi), they were favored. Ole Miss is mediocre, and Mississippi State has had, all things considered, a great season. But then they inexplicably lost to the Rebels 41-24. What gives? They obviously hit the wall, but how? Was it loss of energy, in clear case of Ohio U, or was it just the more brutal part of their schedule? The latter cannot explain things alone, since, hello, they lost to Ole Miss, and though the Rebels have improved, they have not improved that much. The answer might therefore be, a little of both. Let us hope Dan Mullen can allow for some of the energy in the team to recover for the bowl game. West Virginia: The Mountaineers were flying high after their big debut in the Big XII, beating Baylor at home in an offensive explosion for the ages, 70-63. 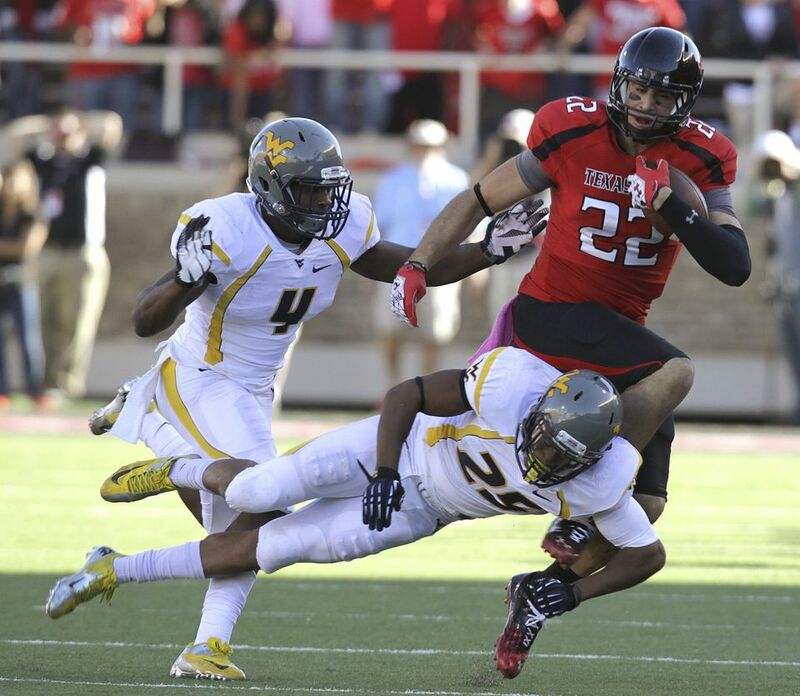 The following week, they journeyed to Austin to take on then-No. 11 Texas, where they beat the host Longhorns 48-45. It went downhill for five straight weeks after that, with consecutive losses to Texas Tech (49-14), Kansas State (55-14), TCU (39-38), Oklahoma State (55-34), and Oklahoma (50-49). Welcome to the Big XII, Dana Holgorsen. The obvious wall WVU hit was tough schedule, plain and simple. That said, five tough losses obviously took something out of the Mountaineers as well, since they had to struggle to beat Iowa State this past weekend. Whether they have recovered any energy at all will be demonstrated when they play Kansas this upcoming week for what should be a fairly easy clean-up win. Louisville: So much for running the table for Louisville after losing to Syracuse 45-17 on the road for their tenth game. To be sure, most of their wins up to that point were a little more than close for comfort, such as beating North Carolina only 39-34, beating Southern Miss 21-17 (the rain notwithstanding), or beating awful South Florida only 27-25. With such a pattern of wins, one would think an ugly loss would be inevitable, if only to get it out of their system. Sadly, whatever ailed the Cardinals in Syracuse did not yet pass, for the following game, they coughed up another loss at home to Connecticut in the third overtime. Worse yet, they only have until this Thursday to bounce back on the road against Rutgers in order to win a BCS bowl berth. The Scarlet Knights lost badly that same day to Pittsburgh, so both teams are in a must-win situation. 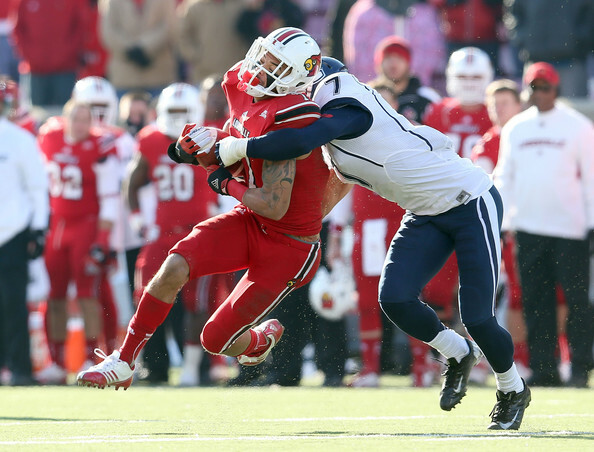 But with the recent pattern of play, the concern remains that U of L might have lost their energy. Thus, the upcoming proposition is dicey at best. Charlie Strong might want to go easy on his boys so they can get their energy. Addendum 12-07-12 — Duke: Part of me says “poor Duke,” while the other part of me says “hey, all things considered, they’re doing pretty well.” But nevertheless, they were flying high during the middle of the season, or high by Duke standards at least! Throught Oct. 6, they were 5-1, with the one loss coming to them on the road against Stanford. Any reasonable person would quickly excuse that! Then the next week, they lossed to Virginia Tech, 41-20. Fair enough. Moreover, credit goes to this team, as the following week, they rebounded to beat North Carolina 33-30. Then came four consecutive losses in their last four regular season games, first to Florida State (48-7; imagine that! ), then to Clemson (56-20), then to Georgian Tech (42-24 — keep in mind that the Yellow Jackets run out of the flexbone! ), and then lossed a shootout to Miami (52-45). In the first three out of four, they were clearly out-manned. The last loss could be attributed to having too much stuffing beat out of them by the first three of those four teams, hence having nothing left in the tank against the ‘Canes. But at least they got a Belk Bowl berth, and have a decent shot at winning it, too, since Cincinnati’s head coach Butch Jones just took the Tennessee job.